In this three-part webinar series, Criteo will talk through exclusive research about how marketers are spending their money on conversion campaigns, how AI is going to change ad tech as we know it, and what a full funnel journey looks like. When you think of AI, you might think of Alexa, or driverless cars, or robots that talk to you. But what is AI in the context of advertising? And how is it impacting the way we connect with consumers? 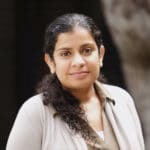 Suju Rajan, SVP of Research at Criteo, explains how AI-powered advertising works and how current AI research is solving some of today’s (and tomorrow’s) most pressing problems. In the final part of “Rethinking Ad-Tech” webinar series, Criteo and mParticle will explore what the shopper journey looks like in 2019 and how marketers can build a framework that can truly respond to individual shopper needs at each stage in that journey. Register Now! When Criteo surveyed 901 marketers around the globe in partnership with Euromonitor International, we wanted to know one thing: what really drives the most conversions? Find out in our on-demand webinar. Watch Now!